firemans picture frame, the perfect gift for the firefighter. Honor the fireman in your family. Makes a great gift for the firefighter and his family! A picture frame for the fireman. Honor the firefighter in your family! Volunteer firefighter and paid fireman.Great for Fire Department Awards,Promotions, and firefighter Graduations! Remember the Past: exempt, retired, and deceased fireman. The Fireman's Picture Frame is designed to replicate the look of an antique metal Maltese Cross, the National insignia of the Fire Department recognized around the world. Each fireman frame is individually cast and painted, which makes it unique. No two fireman frames are exactly the same. Each firefighter frame comes with a personalized engraving plate and stand all included in the sale price of $42.00 plus $6.00 S&H. Firefighters, Show your pride! Buy one for yourself, or as a gift for the firefighter you love. Looks great at the Firehouse. Hang it on the wall or display it on your desk. Every fireman should have one! The perfect firefighter gift. Cast Resin firefighter frames come in three colors; Gold, Silver, Bronze. Approximate Size: 8" x 10" (holds 3" diameter photograph) Easy Setup... Simply place the 3" plexiglass circle over your favorite fireman photograph, trace it, cut it, then place it in the frame.Continental USA orders only. For International Ordering please contact me by clicking on Email Button below. THE FIREMAN STAND AND MATCHING ENGRAVING PLATE ARE INCLUDED IN THE $42.00 PRICE. THE PRICE ALSO INCLUDES UP TO FIVE LINES ENGRAVED WITH A MAXIMUM OF THIRTY CHARACTERS PER LINE, INCLUDING ALL PUNCTUATION AND BLANK SPACES. TO ORDER GO TO "BUY NOW" BUTTON BELOW. (ALL MAJOR CREDIT CARDS ARE ACCEPTED) BEFORE YOU CLICK ON BUTTON, BE SURE TO CLICK ON THE FIREMAN FRAME COLOR ABOVE THE BUTTON FIRST,THEN CLICK THE "BUY NOW" BUTTON.YOU WILL THEN BE TAKEN TO A SECURE PAYMENT "PAYPAL" SITE TO PLACE YOUR ORDER. AFTER FILLING OUT YOUR CREDIT CARD INFO, GO TO "MESSAGE TO SELLER" BOX.THIS IS WHERE YOU FILL IN ENGRAVING PLATE INFO ABOUT THE FIREFIGHTER. ALSO USE "MESSAGE TO SELLER BOX" TO LIST MULTIPLE ENGRAVING INFO WHEN ORDERING MORE THAN ONE FRAME. PLEASE ALLOW 1-2 WEEKS FOR DELIVERY. THANK YOU FOR YOUR ORDER. FIREMAN'S PICTURE FRAME, P.O.BOX 913, ISLAND HEIGHTS, NJ 08732-0913. 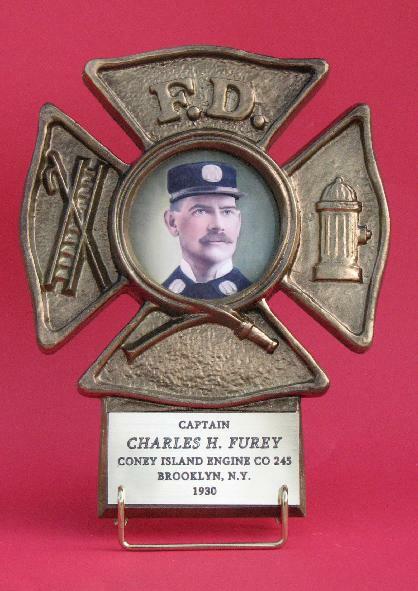 The Fireman's Picture Frame is dedicated to the memory of my Grandfather, Captain Charles H. Furey, FDNY. He is the Fireman pictured in the Frame. 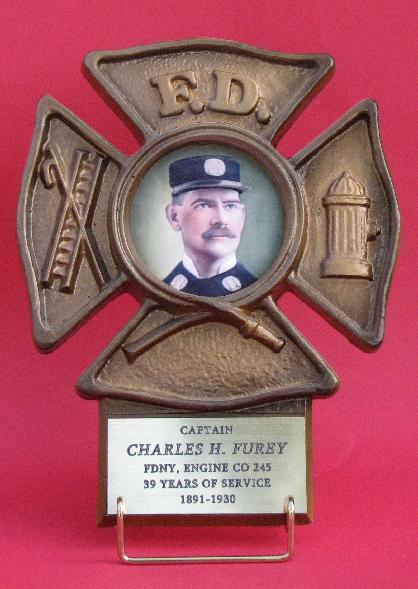 He died in the performance of his duty while fighting a fire in Coney Island on February 14, 1930. He was 61 years old, a veteran of thirty nine years of service in the Fire Department, the last twenty nine years at the rank of Fire Captain. 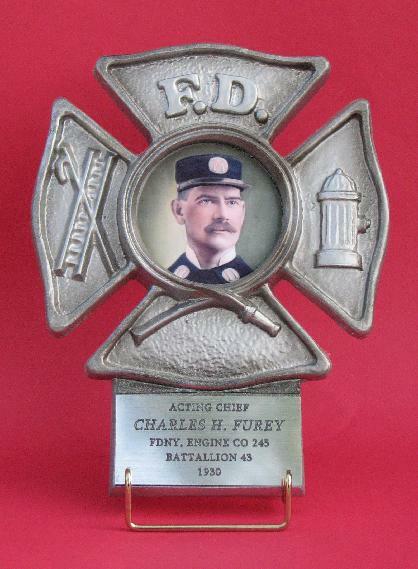 When he was killed, he was serving as Acting Chief attached to Engine Company 245 in Coney Island.TO ORDER YOUR FRAME TODAY, PLEASE GO BACK AND CLICK ON THE "BUY NOW" BUTTON.